Last week we headed out to San Diego for Carissa's graduation. By we, I mean, Eli and me. We had to leave poor Luis behind. I'm guessing by Eli's face, he wasn't too happy about that?? Our gift for Riss, unfortunately, did not arrive before our flight last Thursday. Not wanting to show up empty handed I headed to the kitchen in search of something I could make that was quick and easy using ingredients I already had on-hand. 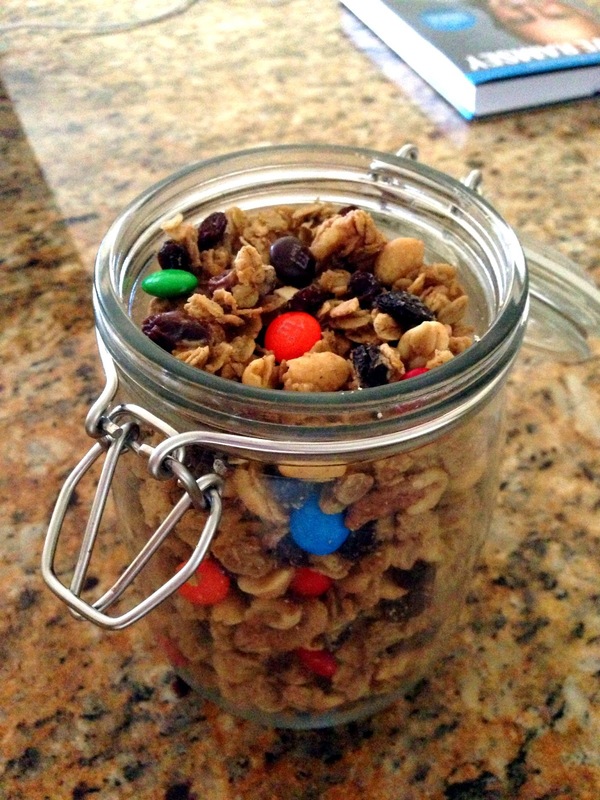 Trail Mix Granola. Which you probably already figured out seeing as how this post is so creatively titled, Trail Mix Granola. This mix was sweet and salty and crunchy and just all around delicious. A great snack for just about anytime of the day. Preheat oven to 250. Mix the oats, salt and peanuts together in a large bowl. Combine brown sugar, maple syrup and olive oil in a saucepan and cook over medium heat until sugar is dissolved. Pour liquid mixture over dry mixture and stir until well combined. Spread onto a baking sheet, being careful that the oats aren't too crowded. They should lay in a single layer. Use two sheets if one is too small. Bake granola until dry and light, about 20 minutes. Be sure to stir half way through. Add the raisins and bake another 20 minutes, again stirring half way through. Sprinkle granola with peanut butter chips and let cool. If you want the peanut butter to be dispersed you can mix it up while it's still melty. When granola is completely cooled, add M&Ms and enjoy. I love the Dave Ramsey book nearby in photo #3!